Bioink development and the bioprinting field as a whole is rapidly progressing. Newly developed bioinks exhibit diverse compositions, chemistries, and sourcing ranging from purely synthetic networks to naturally derived mammalian proteins. As the portfolio of available bioinks approach the diversity of traditional biomaterials, bioprinting may replace traditional construct fabrication techniques in basic research, tissue engineering, and regenerative medicine. It has become apparent that some bioinks are more applicable to certain tissues types than others. The culture of hepatocytes and the engineering of liver tissue constructs can be particularly challenging due to the complex in vivo environment found in native live tissue. For the engineering of these complex tissues, researchers have proposed using bioinks derived from decellularized organs and tissues, known as dECM based bioinks. Unlike purified bioinks from natural sources such as collagen, gelatin, hyaluronic acid, fibrinogen, dECM based bioinks contain the minuet and auxiliary proteins and biomolecules found in the native tissue such as heparins and other GAGs, fibronectins, laminins, bound growth factors and morphogens, and cell adhesive dominations that are essential to native tissue function. One class of bioinks derived from decellularized extracellular matrix are the least ‘pure’ bioink but most closely mimic the chemistry of the native ECM. These bioinks may be particularly useful in the culture of primary cells and the engineering of structurally and metabolically complex tissues such as kidney, liver, brain, and nerve. A recent paper by Lee et al. from the lab of Dong-Woo Cho at POSTECH titled “Development of Liver Decellularized Extracellular Matrix Bioink for Three-Dimensional Cell Printing-Based Liver Tissue Engineering” aimed to develop bioinks based on decellularized liver ECM. The dECM utilized in this study was extracted from porcine livers and after decellularization exhibited the retention of glycosaminoglycans GAGs, fibronectin, and collagens found in the native tissue. 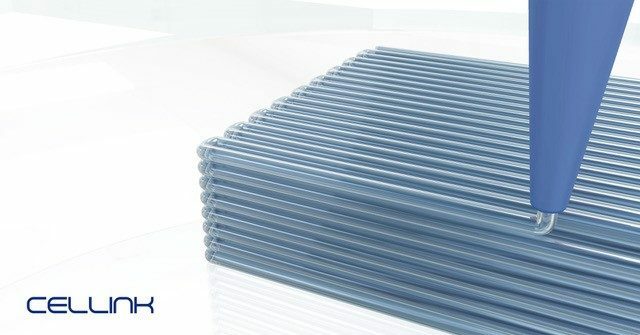 The dECM exhibited favorable printability and was printable from nozzle diameters ranging from 22 to 27 gauges with pressures from 5 kPa to 45 kPa respectively without the need for additional additives. This liver-derived dECM bioink was compared to a collagen-based equivalent. When bone marrow derived mesenchymal stem cells were blended with the liver dECM bioink and bioprinted, a variety of transcription factor genes and hepatocyte specific genes were upregulated after 7 days of culture in the liver dECM compared to the collagen material. Additionally, albumin and urea secretion were evaluated from hepatocytes bioprinted within these constructs, indicating that the hepatocytes were exhibiting liver function. This manuscript contributes to the growing field of mammalian tissue derived bioinks. Bioinks derived from decellularized mammalian organs and tissues may be considered ‘dirtier’ than other biological based bioinks. These materials, unlike those based on isolated macromolecules such as collagen, hyaluronic acid, alginate, and gelatin are not completely purified. The decellularization process seeks to remove cellular components while retaining the rest of the tissue such as the large structural biomacromolecules, and the secondary and auxiliary proteins found in the ECM. Therefore ECM-derived matrices possess a complex composition that mimics the biochemistry of the native tissue. How can well can the dECM derived bioinks be controlled batch to batch due to the need to source from animals and the lack of purification and removal of unwanted components? How different is the dECM derived from mature animal tissues from developing or juvenile animals? How may these differences influence cell behavior in the matrix and ultimately tissue development. Will dECM bioinks have more application as stand alone bioinks or as supplements that are blended into more pure bioinks to impart bioactivity in the construct? For what tissues is the incorporation of dECM bioinks necessary for the generation of tissue constructs? Is it necessary to have specific dECMs for all tissues or are there certain dECMs that can be applicable to a wide range of tissues due to similarities in tissue microstructure and supplementary protein concentrations? Due to their natural origin and minimal processing, is there a risk of immune response (from residual cellular components or proteins found in the tissue) with the implantation of dECM based scaffolds? We are looking forward to more papers out of the Cho lab at POSTECH and are keeping are eye on what other exciting research is coming out in the next couple months!